Designspiration Job Board | Shelby White - The blog of artist, visual designer and entrepreneur Shelby White. I’ve been working non-stop over the last few months to get new features live for Designspiration. One of these features is the Job Board. The goal of the job board is to help creatives find career opportunities, check it out. There were a number of challenging aspects of building this addition, but the main one was how to handle mobile. It’s not something I’ve done a whole lot of and just to complicate things, a new grid needed to be developed for the updates following this one. The restructuring of the grid took just about as much time to figure out as it did to build the job board itself. If you know an agency or company looking to hire, please let them know about the job board. 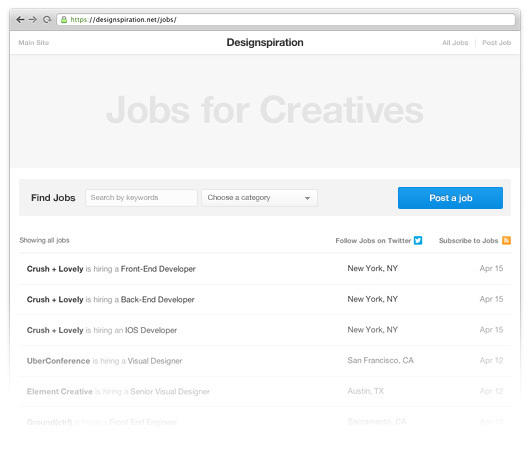 Also, follow the Designspiration jobs twitter @Dspnjobs for job updates. Most are British, with the exception of some French champagne makers and South Korean electronics giant Samsung. Small family businesses rub shoulders with global brands such as Twinings tea or Schweppes soft drinks. nike shox o leven “Signs become clear that risks to GDP growth are tilting to the downside,” Qu said. “This calls for policy fine-tuning measures to stabilize market expectations and steady the pace of growth in the coming quarters.” The official Purchasing Managers’ Index, released on Saturday by the National Bureau of Statistics and the China Federation of Logistics and Purchasing, dropped to 50.2 in February from 50.5 a month earlier. The official PMI is slanted towards state-owned manufacturers. But Dijsselbloem had told the Ta Nea daily after a lecture in The Hague on Wednesday that “many finance ministers of the eurozone are starting to lose patience,” the paper reported. http://www.mgmrh.com.br/form.php?blusa-hollister-feminina/ The economy has hit a speed bump, with higher taxes and government spending cuts crimping consumer spending and weighing on manufacturing activity. Growth estimates for this quarter currently range between a 1.2 percent and 2 percent annual pace. It is not pleasant to cycle with a abundant rucksack. It also makes it contrary to look greater than your shoulder. If you get a all right basket and / or panniers you will be talented to carry your shopping and increase the usefulness of castelli maillot bike. Cycling is perceived as a risky activity. Regardless how, in business it is less dangerous than people may fear. The indifference possibly of being knotty in unsmiling abuse, should be turn against the healthfulness benefits of mediate exercise. Szijjarto also called for more cooperation and fairness in addressing rising trade disputes between the European Union and China. blusa hollister Kimberly-Clark rose US$4.14, or 4.2 percent, to US$102.97 after the maker of Kleenex tissues and Huggies diapers said its third-quarter net income rose 6 percent. Lloyds, 39 percent owned by the government, sold more PPI policies than rivals. http://www.contag.org.br/search.php?abercrombie-and-fitch-brasil-2/ Sina Weibos planned initial public offering stretches financial logic. Listing a US$500 million stake in Chinas version of Twitter looks like a response to sky-high tech valuations most recently Facebooks US$19 billion acquisition of messaging service WhatsApp. But investors can already buy shares in parent Sina, whose value is mostly made up of Weibo already. They should be skeptical about the idea that two plus two is five. With over 61 million active users a day, Weibo is one of Chinas most hyped social networks. Yet owner Sina Corp, which also operates web portals, has only lately started to try and monetize it. Revenue from the microblog grew 34 percent in the quarter ending December 31 to US$71.4 million, compared with the previous three months. A chunk of that came from a tie-up with e-commerce giant Alibaba, which owns 18 percent of the microblog, with the option to increase to 30 percent. Sina is now seizing on red-hot tech valuations to plan a listing of a minority stake in Weibo. Indeed, since Alibaba bought its stake in April 2013, valuing the microblog at US$3.3 billion, Weibos prospects may have increased dramatically. Assume Weibos revenue continues to grow at about a third, quarter on quarter, for the next year. It could potentially make around US$620 million in revenues for 2014. Apply an earnings margin of 30 percent, comparable to gaming group Tencent and search engine Baidu, and the same valuation multiple investors give to parent Sina, and Weibo could be worth over US$5.5 billion an increase of 67 percent in less than a year. Sinas own share price over that time has increased by just a third. The question is why investors would give a higher value to Weibo after a partial spin-off. Sinas 70 percent share of a theoretically listed Weibo is already the lions share of its market capitalization, which increased just 4 percent on February 24 to US$5.1 billion. And Sinas structure isnt complex its only other business is a shrinking web portal division, so its unlikely investors are missing something important. Chasing hot valuations is understandable, but investors should be wary of what looks like an attempt to create something from nothing. The author is a Reuters Breakingviews columnist.